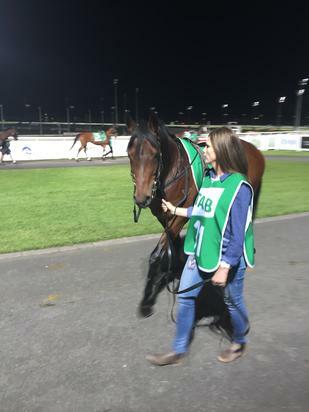 Stylish 3 year old Empire Liberty put the writing on the wall with an impressive first up run recently at Cranbourne. The 3 year old son of Statue of Liberty was resuming after a tumultuous first preparation where he was lucky to stay on his feet on debut, then ran into a city standard race at his second start, but not disgraced finishing 5 lengths behind smart performers Octobello and Confluence. Hard to be confident heading into a first up run with a maiden galloper in 0-58 with 3 duck eggs next his name however, his work and trials belied his form on paper. Patiently handled by Michael Trotter Empire Liberty looks to be a promising 3 year old. A smart ride from Dale Smith positioned him midfield 3 wide with cover from the outside barrier. Prior to the turn you could sense that Empire Liberty was going to run on and a quick decision by Dale to wait and go between runners rather than go around them enabled him to hit the line hard and get up for second at the big odds. Great result to perform so well against older more seasoned horses taking a 6 time winner to beat him. An astute Boutique Bloodstock purchase from the Inglis VOBIS Gold Sale, Empire Liberty was initially prepared for the Ready 2 Race Sale in 2016. After failing to make his $60,000 reserve he was retained and raced by good friends and clients of Trotter Racing. Looking forward to Empire Liberty's next run where he is most likely to stick to his home track at Cranbourne.